Summary: Folding bicycle helmets are easier to carry off the bike and could be useful for shared bicycle system users. There are some decent ones on the market, including some that meet US standards. Folding a helmet can make it easier to carry, so users of folding bicycles have always found them appealing. Users of shared bicycle systems would like a collapsible helmet they could tuck into a purse or briefcase and pull out when they use one of the shared bikes. Although a helmet may fold, if it uses conventional materials it still requires the same volume of impact foam. To manage the energy of an impact, the foam must be thick enough to give the head enough distance to stop in a controlled deceleration. So the helmet materials can fold, but the volume of material itself will be the same, limiting the compactness. In addition, the helmet has to maintain its structural integrity in an impact, requiring engineering skill and probably more expensive materials to construct. Designs that escape that rule may be coming, but are not on the market yet. Biologic's Pango appeared in 2012. The current design by Biologic has two sides that fold into the center. It does not meet the CPSC standard, so it is not available in the US market, but it meets the CEN standard and is sold in Europe. Carrera introduced for 2013 a folding helmet initially dubbed the "Accordion" model, now known as the Foldable. It is made of strips joined by an elastic frame that opens to provide vents between the strips and folds into a solid piece to reduce the width for storage by about 20 per cent. Said to be inspired by the old racers' "hairnets." This YouTube clip from the 2012 Eurobike show shows it in action, and there is more on it here. There are variations including the Foldable Crit model. Carrera says they fit well because of the folding construction. We don't like the gaps between the strips on the front edge, leaving corners that might do more damage to your face in a crash than a continuous edge would. Initially designed only to the European EN 1078 standard, Carrera says they now have CPSC models as well. Online prices vary widely. The rings give the helmet an unusual round profile. Unfortunately the Closca has a cloth cover rather than plastic. It retails on their web site for €62. 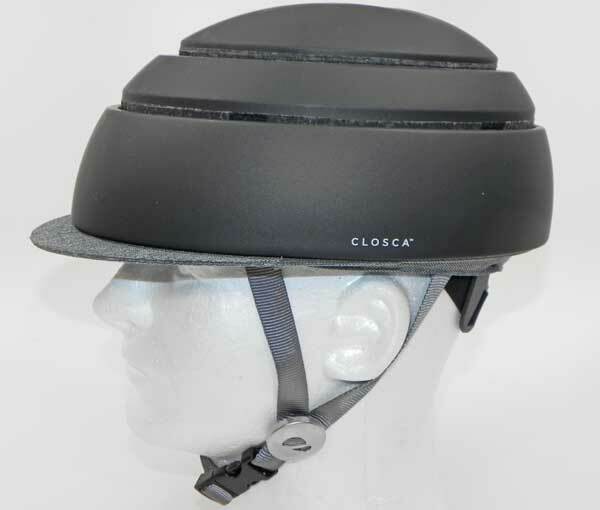 For 2019 Closca has introduced their new Loop model, known in the US as The Stack or The 174 Hudson Stack. The shape is a little different from the original Closca, with a forward-swept lower ring. But the concept is the same, with telescoping rings that Closca says reduce the helmet's volume by 45%. And fully extended the helmet is round and smooth. Certified to the US CPSC standard and to EN1072. Cost is €70 in Europe and $80 in the US through Priority Bicycles. 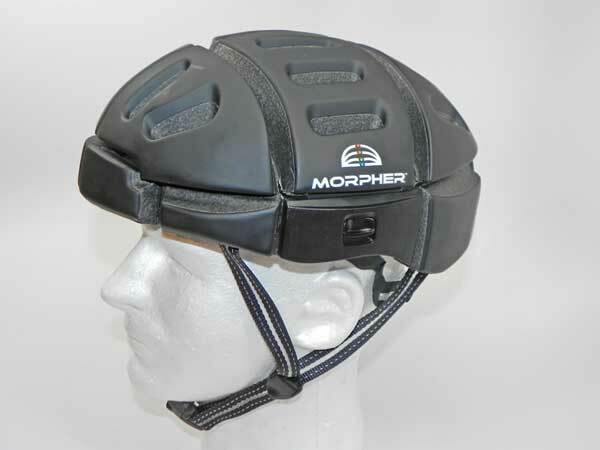 Morpher began raising funds on November 1, 2013 through Indiegogo to launch a new line of helmets. 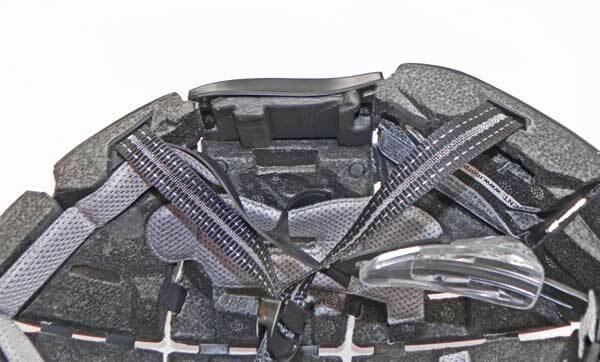 The helmet is made of segmented blocks of foam joined by internal plastic straps like the old non-folding SportScope design, with plastic clips on each side holding it in helmet shape. The clips require two hands to unfold the helmet, and on our sample they were initially stiff and difficult to snap in place. The helmet is still flexible when unfolded and the clips are fastened, and it presses inward on the sides. We found the original model less than comfortable. It had "hot spots" where angular foam bumps contacted the head and when unfolded the segmented construction still caused it to press on the sides of the head. A more recent revision of the design has dealt with that problem. We have tried it briefly, and it seemed much improved, but we have not tried it for a long ride to see how well it works. for briefcase or purse carrying the Morpher folds to just under 3 inches (75mm). When folded, the helmet has four internal magnets that help to keep it flat, seen as the small circles below the side clips in this interior photo. The Fidlock buckle is held together by a magnet. The original strap junctions did not hold well, and we found it hard to adjust for a truly stable fit. Morpher has redesigned the junctions. Morpher produces a CPSC model. Although the only color available at the outset was matte black, there is a new white option. There are two small reflective rear logos and reflective strap stitching. The US retail price is $145. 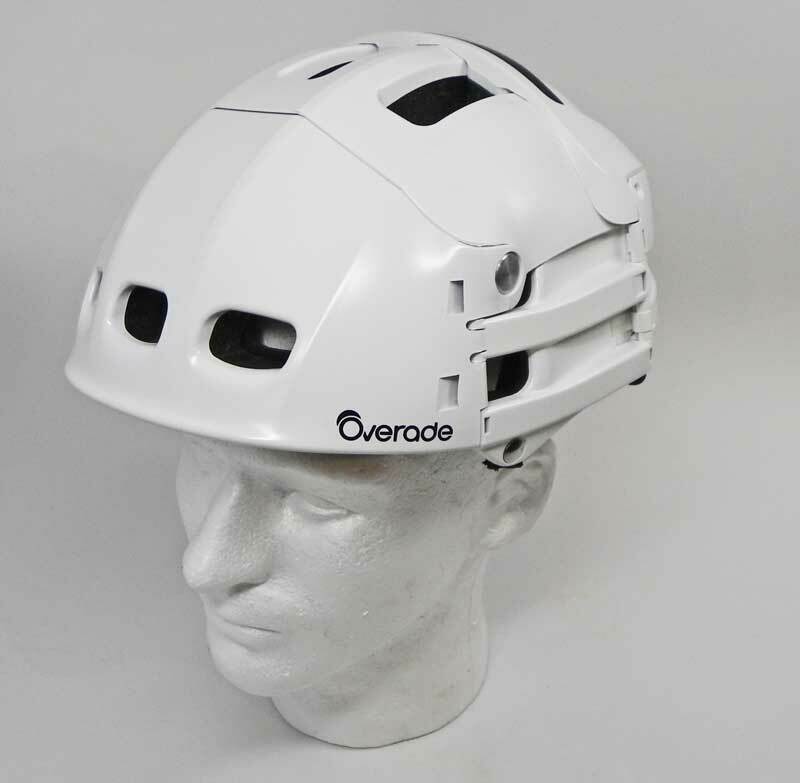 Overade has a folding hardshell helmet called the Plixi with a complex folding mechanism. It meets the CPSC and CEN helmet standards. Consumer Reports rated its impact performance as Very Good in their 2016 helmet article, but downrated it for fit and ventilation. You can see the folding action in this video. The Overade folds into a chunk instead of flattening like most folders. Folded measurements are about 4.75" (120mm) by 8.4" (210mm) by 6.4" (106mm). There are accessories to include a visor and rain cover. Strap junctions on our sample did not hold at all, so fitting would be difficult without sewing the straps or using rubber bands below the fittings to prevent them from slipping. It is available on the Overade web page for 75 Euros, on the UK market for as little as 60 Pounds and now in the US at about $100, all plus shipping. Weshine Online is marketing a folding paper helmet that appears in the photos to be almost the same design as the Spitfire Industries Ego listed below. It is advertised as made of "cardstock." There is nothing on the WeshineOnline site about meeting any standard. 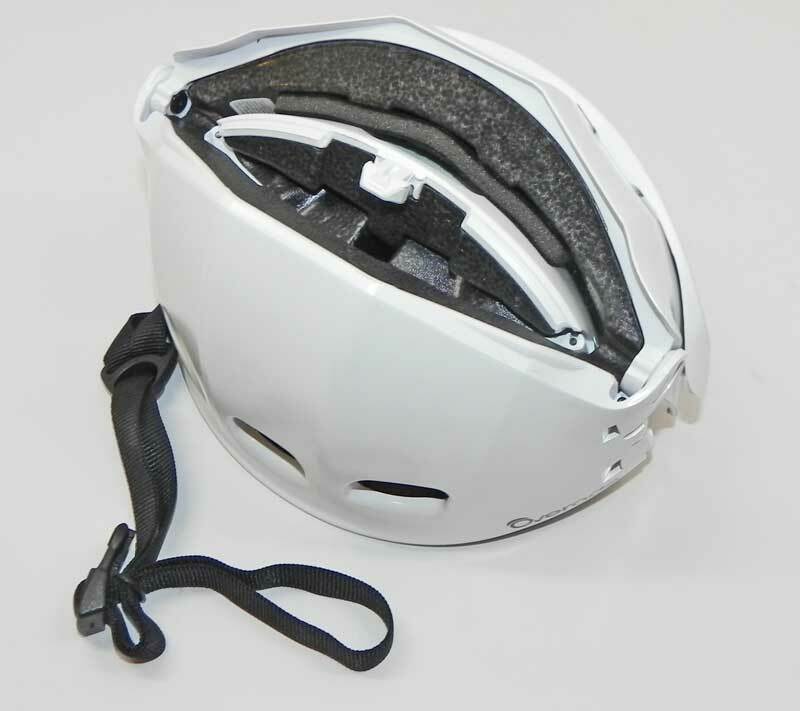 Weshine Online is a Chinese company, but to sell in the US the helmet has to meet the CPSC standard. The price is lower on Amazon at $30, and $36 on the Weshine Online site, but Weshine includes shipping. 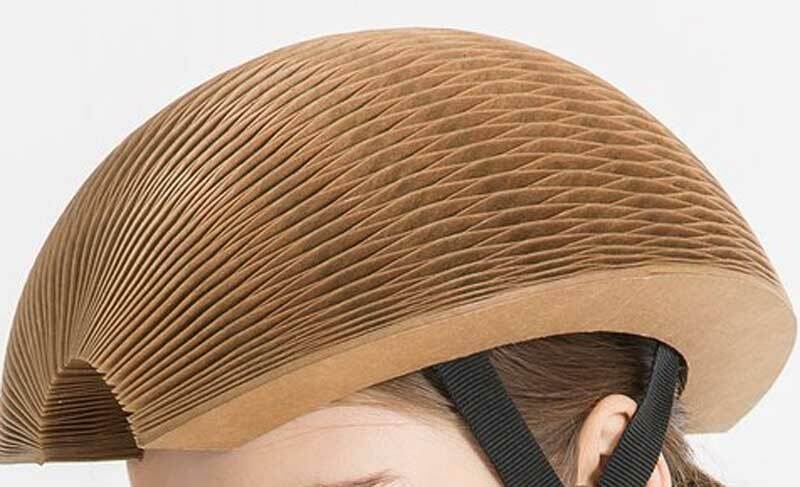 HeadKayse has run an Indiegogo campaign to develop a new soft helmet that folds, promised in early 2017. The design is interesting, with no standard EPS foam but a flexible material they call "Enkayse." It is a multi-impact material and the manufacturer says it outperforms EPS in lesser impacts. They say the helmet flattens to less than 2" (5cm). Designed only for the European EN1078 standard. See the web page for more. We subscribed to the campaign and are waiting for our sample. Park & Diamond has developed a folding (or rollup) design and is promoting it with an Indiegogo campaign. The design "Looks and feels like a baseball cap," but has a strap and is designed to meet the CPSC standard. Weighs 8 oz. Estimated delivery as of September 2018 is February 2019. Put A LID on It has been developing a low cost folding helmet designed for shared bicycle programs, particularly the London system. In mid-2016 their site said they will launch the crowdfunding effort soon. 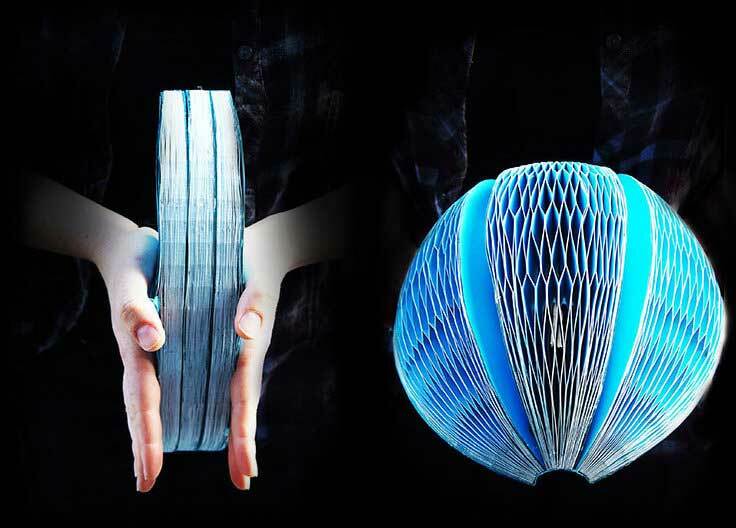 Spitfire Industry is developing a new Eco Helmet model made of recyclable paper in a radial honeycomb pattern. This will be an exciting new model if it can meet standards. 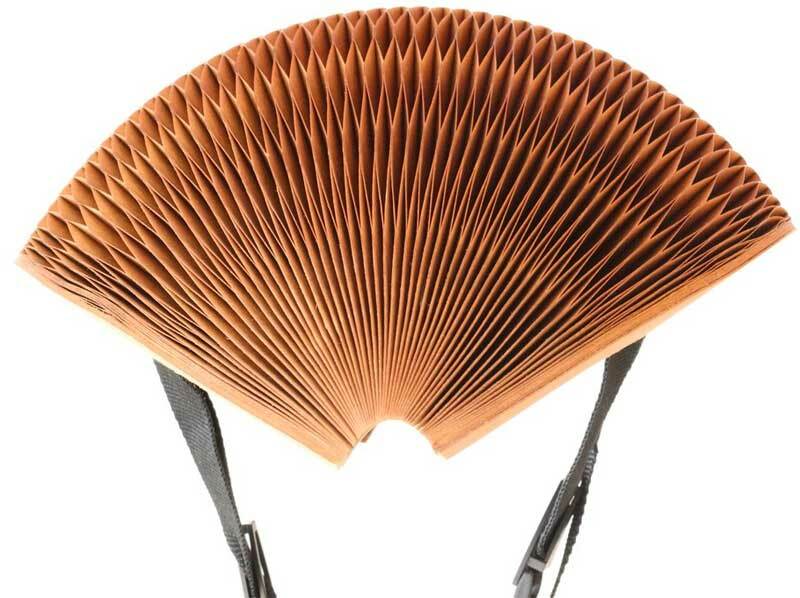 It folds flat and is said to be very inexpensive to produce. They are intended to be readily available for shared bike system users. Folded or not, a helmet is another item for a pedestrian to carry unless planning in advance to use a borrowed or shared rental bicycle. That may not be a problem for backpack users, but those with purses or briefcases have to carry a non-folding helmet elsewhere. We are glad to see models in the market that meet the US standard, and hope for more. This page was revised or reformatted on: April 3, 2019.